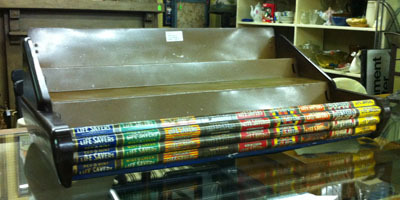 I don’t know how I’d use this vintage metal Life Savers candy display from the 1930s or 1940s. But I did think it was retro-cool enough to take a pic in the antique store. But still, aside from using this on a movie set, what would you do with it? Please tell me. I have this same rack. When I was a teen I used it for CDS or make up depending on my age. Do you know how much this was priced? Vanessa. Sorry. I don’t recall the price, but I’m thinking it was around $150. I’m not sure though.